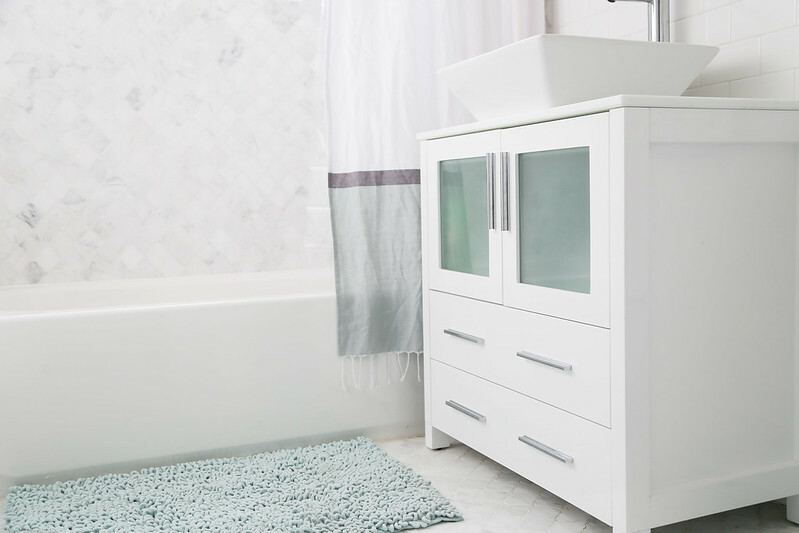 I'm super excited to finally share my bathroom renovation with all of you. As I promised, not only am I sharing photos but I'm also sharing direct links to where I purchased everything. I know a lot of you are thinking of revamping your space and hopefully this serves as inspiration. When we first purchased our house the bathroom wasn't in terrible conditions although it was a little too pink for my taste and backdated. Our home was built in the early 1920's and was partially renovated in the 50's. I didn't hate it at all. Maybe if it was an apartment I was renting, I wouldn't have mind but since it's our first home in which we will be living in for many years to come, I think the change was necessary. As you can see below, the bathroom was in great shape. The previous owner even changed the vanity a few months before selling us the house. hotel bathrooms. 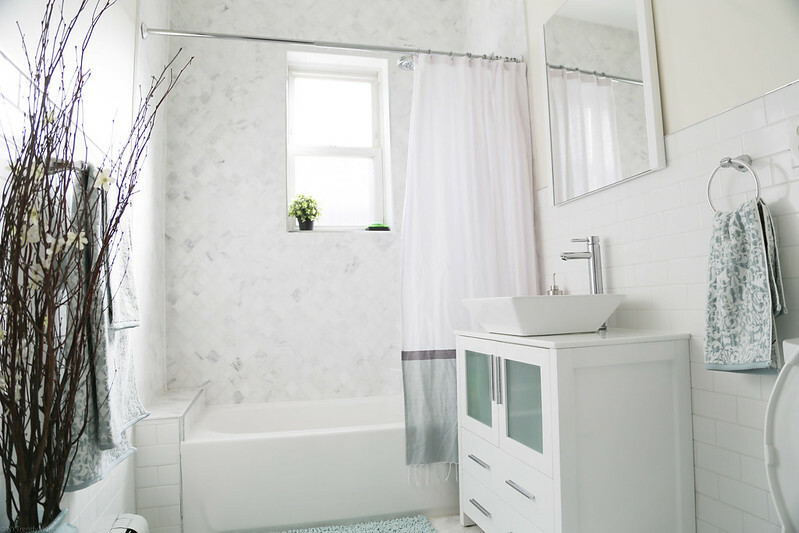 I know, it's cheesy but I love for clean, fresh looking bathrooms. Theres just a nice peaceful and relaxing factor to this. & after being scarred by this pink bathroom I wanted anything but color. 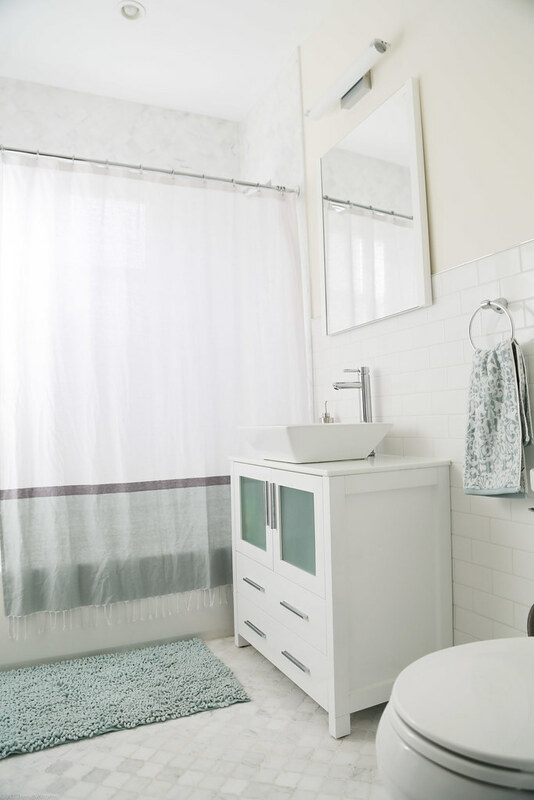 A clean space that's easy on the eyes is what any mother of 2 (soon to-be 3) needs after a long day. We had a tight space to work with but I think we utilized the space to it's highest potential. It still blows my mind how you can design your own space from scratch. I thought this was only something you could do on The Sims, a game I used to love as a kid. For my bathroom I wanted marble on the floor and on the bath/shower portion. In the begging of the renovation I asked you guys to help me decide on two tiles and I'm glad you all made my decision easier. I went with this stunning Carrara Florence Italiano Lantern Mosaic tile. 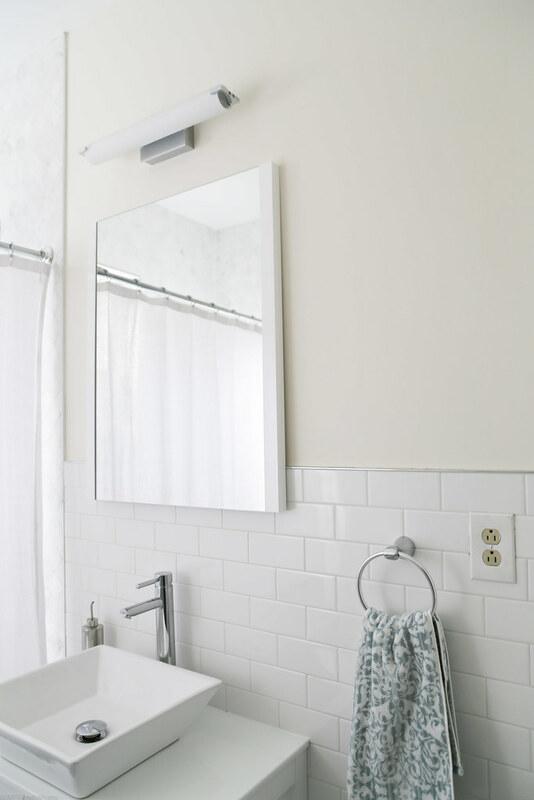 After seeing all the marble tiles in, I changed my mind about adding anymore to the room and went with something more simple and timeless like plain white subway tiles. I only added the subway tiles on half of the room because in the future I want to hang a painting across the mirror. Maybe something like this here. With kids around it's almost impossible to have anything white last for more than two days. Therefore, I decided to add a few light blue/teal hints throughout the room for pops of color while still keeping the theme fresh. My towels are by Peri Home. 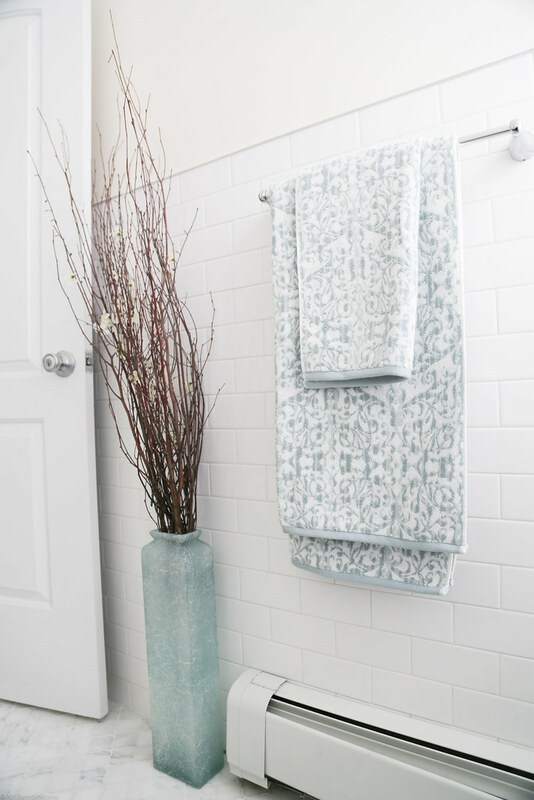 I couldn't find the same towels but I did find similar ones here. For my rug I wanted something with a little texture so it could tickle my feet when I get out there shower.. haha jk. I went with a beautiful chenille rug. I found the same texture rug here and here but in a different color. My shower curtain is from Target's newest line, Project 62. Since I bought it, it's gone down in price. Click here to see for yourself. Following the teal theme I added a tall floor vase with birch twigs from Michaels. Ok, now this has to be the most frequently asked question on my social accounts since the bathroom was done. I got them on my comments sections, direct messages and facebook account. "Where is your vanity from?" It took us three weeks to get this delivered because it was a new released item and no stores had them yet and the fact that I wanted this mirror didn't make it easier. I had to have this one because I loved the vessel sink and all the space underneath it. That meant I could have all my girly products (shampoo/lotions) without anyone having to see them when they walk in. 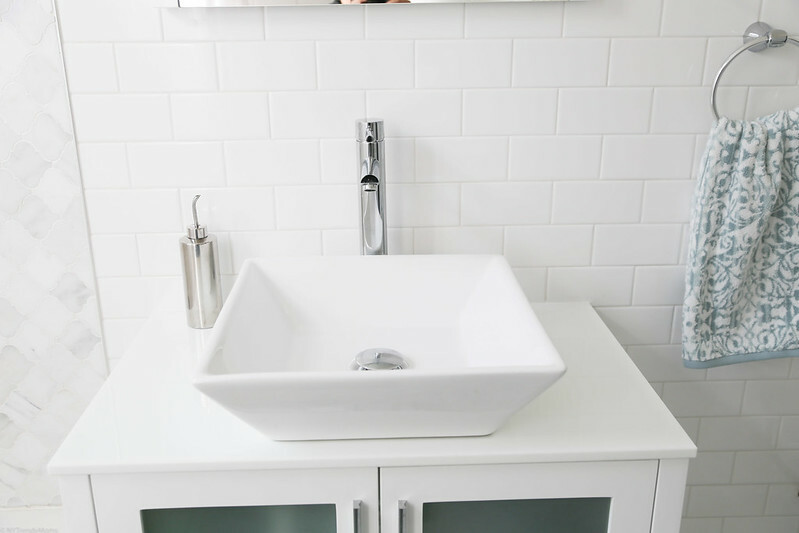 The vanity is by Fresca and it comes in two other colors. View item details here. 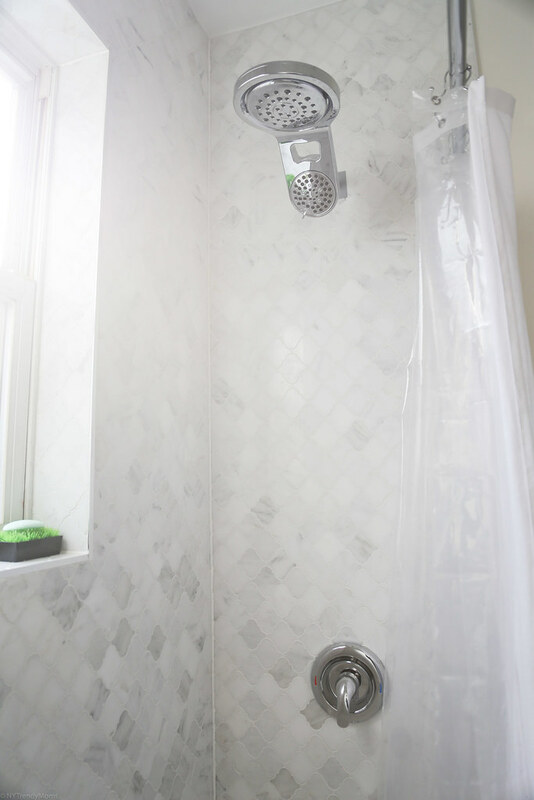 For the shower I have a beautiful Nebia shower that still needs to be installed (I'm going to make it a priority this weekend since we're snowed in) but in the meantime we are using this Delta shower head here. & that is it! That's my bathroom in which I will be spending a lot of time in.. specially after my Nebia shower is up. I love the new renovation! Personally, I also love the clean and crisp look for certain parts of the house, especially rooms that get alot of natural lighting. You did a fabulous job, thanks for sharing! Thanks so much. I was thinking the same. Clean and crisp never goes out of style.